When Should a Paralegal Go to Law School? As a paralegal, you’ve got an inside view of legal practice. At some point, it’s natural to wonder whether you’d be better off as a lawyer. 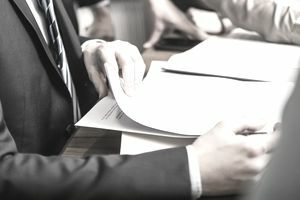 After all, you’ve got a lot more on-the-ground experience than incoming associates, many of whom have never set foot in a courtroom or seen a set of M&A documents. Couldn’t you apply what you’ve learned to move up the ranks as a lawyer? Before you make the big move, here are a few things to consider. Will You Really Be Getting a Salary Upgrade? Paralegals who want to become lawyers are often tempted by the higher base salaries lawyers typically make. But this number might be misleading. Attorneys are salaried and don’t get paid more if they work overtime. In contrast, paralegals get paid more the more they work. When you’re talking about a trial situation, where everyone on the team is working 20-hour days (not that uncommon, sadly), the paralegals might be making more per hour than many of the attorneys! Before you decide to invest $100,000 or more in law school for a higher salary, do the math and make sure it’s going to result in a higher hourly rate (taking into account any student loan payments you might be left with). How Will Your Quality of Life Be Impacted? Although it might not seem like it if you’re an in-demand paralegal, you probably have more control over your work-life balance than an attorney does. Because you get paid overtime, attorneys give at least some attention the number of hours you’re being asked to work. As an attorney, you’ll essentially be on call all the time, something many people find deeply unpleasant. Another prime motivator for considering a transition from paralegal to attorney is to do more interesting or more challenging work. Here, it’s important to look carefully at the work lawyers, particularly young lawyers, actually do. While the life of a senior partner might look glamorous while you’re handing up documents for cross-examination in court, keep in mind that it takes many years to get to this point. As a new lawyer, you’ll still have to pay your dues in the trenches, doing rote work that might be less interesting than organizing all the documents for a case as a paralegal. Before you decide to go to law school, do some informational interviews with lawyers at your firm (if you are comfortable letting them know you might pursue this path) or with other lawyers you know. Get a good feel for what they do all day, so you’ll be in a position to evaluate whether “lawyer work” is really what you want to do. What Type of Job Will You Be Able to Get? Paralegals who go to law school sometimes expect they’ll have a leg up in the hiring process, but even when you have related work experience, the legal field is a very hierarchal place. If you work for an AmLaw firm as a paralegal, it’s unlikely you’ll be hired there as a lawyer unless you end up at a top law school. Personal connections are important, of course, but they only go so far. Ultimately, pedigree still carries the day in many places. If you decide to go for it and apply to law school, consider ways to keep your debt down and you’ll have more options when you graduate. Unless you’re aiming for a fancy BigLaw job, going to law school part-time while continuing to work might be a good option.